Yoga is one of the best forms of workouts you can take up when you are expecting. It is especially beneficial when you combine it with a mild cardio like walking. It helps the super anxious, yet excited moms-to-be stay in shape and deal with all the physical and emotional changes with ease. At the outset, yoga helps you relax. Pregnancy evokes a whole lot of emotions. Apart from elation, you tend to have scary, negative thoughts too. Practicing yoga calms your mind and prepares your body for the extreme changes that it will go through in the months to come. It also helps tone the muscles, maintain integrity and balance, and enhances blood circulation. Practicing yoga reduces the impact on the joints. When you practice yoga, you combine it with breathing, and the full Yoga breath or Ujjayi works wonders when you are expecting. Inhaling slowly through your nose to fully fill up your lungs, and then slowly exhaling preps you for labor. It also trains you to stay calm when you need it most. Pain and fright make your body produce adrenaline, and this leads to the lesser production of oxytocin. Oxytocin is a hormone that helps labor progress. Practicing yoga regularly throughout your pregnancy will help you resist the urge to tighten your body when you feel the pain. You will be able to relax and steer through labor quickly. Your first trimester ought to be most taxing. Although there is not much to give away your pregnancy externally, the body is busy creating a life-support system for your baby. Hormones are released to build the uterine lining, and the volume of blood increases. The blood pressure drops because the heart is busy pumping all that extra blood. The muscle tissues relax, and the joints loosen. This allows the uterus to stretch and create space for the baby to grow. The first part of the first trimester is also the time when you are at high risk of a miscarriage. Therefore, with so much happening in the body, it is important to choose the right kind of physical activity to create the right environment in the uterus and to ensure proper implantation of the embryo and attachment of the placenta. First and foremost, you must check with your doctor if it is okay for you to begin or continue with yoga. Once you get a clean chit from the doctor, you must inform your yoga instructor about your pregnancy. You may not have too many restrictions in your early pregnancy. But make sure you follow the rules and indulge in safe exercises. You must keep yourself hydrated and drink enough water before and after the workout. Work on your breathing, and coordinate your movements with deep breathing. You must begin to listen to your body and trust what it says. Look for modifications if you start feeling pain or discomfort while practicing an asana. When it comes to the poses you can practice in this trimester, all basic poses are ok to practice. Most standing poses, balancing poses, and leg-strengthening poses are all right. While practicing the balancing poses, make sure you stand close to a wall so that you can instantly hold it in case you feel dizzy or lose balance. The leg strengthening poses and pelvic floor poses enhance the circulation of blood, and this helps to prevent cramping. Try to avoid poses that involve revolving as they will put a whole lot of pressure on the abdominal cavity. Seated hip openers are ideal because they help improve your flexibility and prep you for an easy labor. Make sure you do not overdo these asanas. Avoid intense abdominal work. The uterus is too delicate at this point. Avoid backbends, inversions, closed twists, and intense Vinyasas. You could practice Shavasana, but start training yourself for the side lying modification (mentioned below). By the time you reach the fourth month of your pregnancy, you start showing. The belly begins to stretch as it accommodates the growing baby. The breasts also become fuller, and the milk ducts are stimulated. The pelvis joints are loosened, and the belly ligaments are stretched. All of this puts a whole lot of weight and pressure on the back as your body fights to maintain balance. If you have no complications and have a healthy pregnancy, the hormones will lower your blood pressure owing to all the extra fluids. You could have headaches, feel dizzy, and you might even notice swelling in your feet and hands. You might see a gain in weight by this stage. You may also start having issues with sleep. 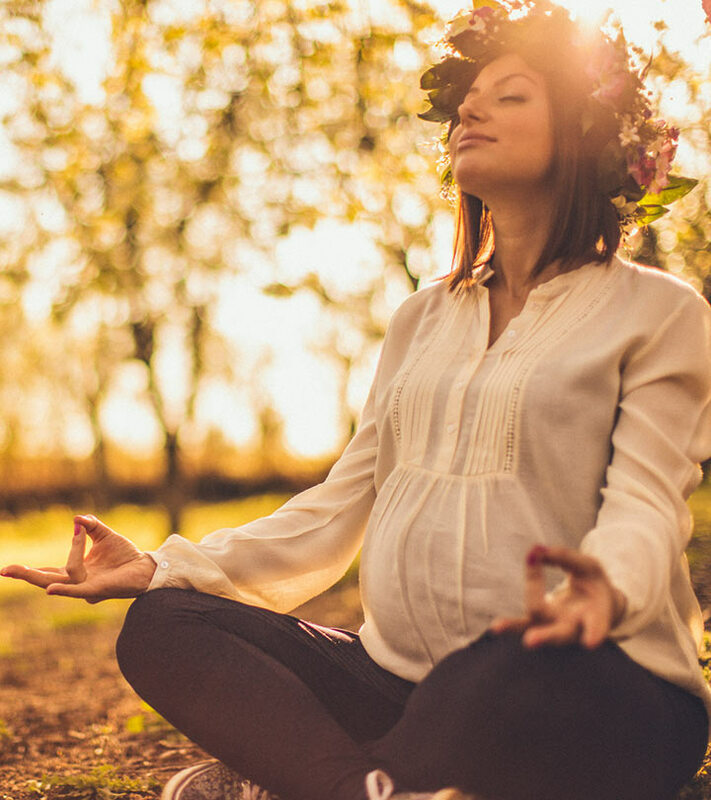 In this stage of pregnancy, yoga is all about alleviating discomfort. It is important you tell your instructor exactly what you feel so that they can help you overcome these problems. By this time, you must realize that you can’t push yourself during a workout. Hold a pose only as long as you are comfortable. Use pillows wherever required to give your growing belly maximum comfort. You also have to accept that your growing belly will alter your sense of balance. Take your time with the workout. Standing poses are safe to practice during this trimester. You must be aware of which muscles are working in which asana so that you can adequately protect them. Use a chair if you need to, but do not strain your pelvic area. Chest and hip openers are ideal for this trimester. Once you cross week 20, lying on your back is an absolute no-no. The weight of your uterus bears heavily on the vena cava, a vein that carries blood from the lower body to the heart, and this could be dangerous. You could also practice poses that increase the blood circulation in the legs. At this stage, you could also begin to do Pranayama. This will teach you to control your breath and calm down. The breathing techniques will help you during labor. However, avoid practicing Pranayamas that include retention of the breath or alter the flow of air. This could cut off the oxygen supply to the fetus. At this point, you also need to avoid folds, backbends, and poses on your stomach or back. Twists and inversions must be avoided too. The second trimester is known to be the best one of the pregnancy. Embrace and enjoy it! All of these changes make the last trimester pretty stressful for the expectant mother. It is important you divert your mind away from the negative thoughts, and allow your body to lead the way. While practicing yoga, remember that the objective is to relax completely. You need to be comfortable, so make sure you use props. Do not hold the asanas you practice for too long. Ensure that you have a wall for support at all times. You might not be able to balance very well at this time, and a fall is the last thing you want right now! Practice asanas that will help you build strength in the legs. This will help you balance better. You also need your spine to realign and inculcate proper circulation of blood. Hip openers are also essential. They remove the pressure off the lower back and help alleviate the pain. These asanas will also ensure easy labor. Pelvic tilts will help push the baby down, and also encourage proper positioning of the child. 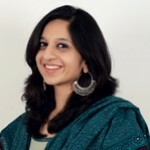 In this trimester, the focus has to be more on breathing and less on the asana. Use your breath at this stage to connect with your baby. Your breath is what is feeding and fueling your baby. When you realize that, your connection with your child is bound to be stronger. Inversions, backbends, and intense abdominal work are an absolute no-no at this stage. Now that you have an insight into what goes on in your body at each stage, and what you need to do to help you out, take a look at these ideal asanas that will support you through your pregnancy. Although these are only a few, they work wonders for you. But make sure you practice these prenatal yoga asanas only under the guidance of an instructor. This is not the time to experiment. Benefits – This asana stimulates the muscles in your legs, especially the hips and thighs. The weight of your body is on your thighs and legs. This asana tones and strengthens them. This is essential during pregnancy to transfer some stress and weight from your back and abdomen to your legs. This asana also increases the circulation of blood in your limbs, thus reducing and preventing swelling. How To Do It – Assume the Tadasana and gently bend your knees. Lower your buttocks such that it seems like you are seated on an imaginary chair. Inhale and extend your arms over your head. Hold the pose for a few seconds as you keep the flow of your breath going. Release. Pregnancy Modifications – Make sure you practice this asana next to a wall or with a chair beside you for instant support in case you lose balance. Benefits – This asana lets you explore your upper body. Your chest opens up, and your legs are strengthened. It also restores the health of the spine and prepares it to take the weight of the growing uterus. It also relaxes the mind and helps you focus and balance. How To Do It – Start off by placing both your feet hip-width apart. Now, pivot on your left foot, and let the right foot face forward. The arch of the left foot must be in line with the right foot. Lower the pelvis and assume a lunge. Lift your arms above your head and look forward. Hold the pose only for as long as it is comfortable. Release and repeat with the left foot forward. Pregnancy Modifications – Make sure you practice this asana next to a wall or with a chair beside you for instant support in case you lose balance. Also, as your pregnancy progresses, lessen the widening of your feet to reduce the strain on your pelvic floor. Benefits – Much like the Warrior I, this asana also allows you to explore your upper body. It helps you open up your chest and widen your upper and lower body. Your legs are strengthened too. The Virabhadrasana II also works on the back and strengthens the spine. This helps it bear the weight of the growing uterus. You learn to focus, balance, and above all, your body learns to calm down. How To Do It – Widen your legs such that they are hip-width apart. Twist the right heel and point the toes outward. Use the left heel to ground yourself. The arch of your left heel should be in line with the right foot. Lower the hips and radiate all your energy out as you stretch out your arms. The arms must be in line with the shoulders. Look forward. Breathe long and deep and hold the pose only until you are comfortable. Release, and repeat on the other side. Benefits – This asana strengthens the legs and allows for fresh lots of blood to flow throughout your body. It ensures that your baby gets all the nutrients it should, as nutrient-rich blood and pure oxygen move to your abdomen area. The circulation of blood and lymph eliminates unnecessary toxins. Your back is stretched, and your body is flexed. You feel refreshed and energized as you practice this asana. In the first trimester, this asana could help you deal with morning sickness. How To Do It – Place your feet apart. Raise your arms, placing them parallel to the floor. Your palms must face downwards. Now, turn your left foot at a 45-degree angle, and the right foot at a 90-degree angle. The heels should come into a straight line. Gently twist your body to the right. Extend the upper body, and slowly bend towards the floor. Your right hand should touch the right foot, and the left hand must be extended upwards. Turn your gaze to your left hand. Hold the pose till you are comfortable, and then release. Repeat on the other side. Pregnancy Modifications – Make sure you practice this asana next to a wall or with a chair beside you for instant support in case you lose balance. You can also use a block or a prop to support your lower hand as you do this asana. Make sure you do not feel any strain on your back or abdomen when you practice this asana. Reduce the widening of your feet as your pregnancy progresses. Benefits – This is one of the best yoga poses for pregnant ladies as it stretches and strengthens the legs. It helps reduce swelling in the feet in the last trimester of pregnancy. Through this asana, your hips and chest open up. It allows for blood circulation and stimulates the abdominal organs. Your back and spine are stretched and massaged, and pain is reduced. This asana also helps increase stamina. It relieves constipation, which is a major problem in the first trimester of pregnancy. How To Do It – Widen your legs and place them hip-width apart. Twist the right heel and point the toes outward. Ground yourself using your left heel. The arch of your left heel should be in line with the right foot. Lower the hips and stretch out your arms. Now, slowly bend your body such that the right arm touches the right foot, and your left arm extends upwards. Turn your gaze towards your left arm. Take a deep breath and then hold the pose only until you are comfortable. Release and repeat on the other side. Benefits – This asana, at the outset, relieves the back. It stretches the spine, and allows for the circulation of blood and spinal fluids. This reduces the pressure that the weight of the abdomen adds to the spine. Initially, this asana calms your mind and reduces the effects of morning sickness. As you inch towards your final trimester, it helps the baby move in the right direction with its head towards the cervix. It also encourages the push that the baby needs to move towards the cervix. However, you must do this asana under the guidance of a yoga instructor. How To Do It – Ideally, this asana is done in combination with the Marjariasana, and together, the asanas are called the Cat-Cow. To do the Bitilasana, you must first come onto your fours. Inhale and lift your chin to look up as your back goes into a convex position. Then, move into the Marjariasana by inhaling and lifting your spine to round it so that it becomes concave. Then, bring your chin to your chest. Repeat the two asanas alternatively in coordination with your breath. The asanas must be done at least five times each for best results. Pregnancy Modifications – Make sure you do not feel any strain on your back or abdomen when you practice this asana. Stop as soon as you do. You can also use this asana to bond with your unborn child. Imagine wrapping yourself around your child as you do this asana. Benefits – This asana is a relaxing pose. It relaxes both the back and the mind. The best part about it is that it does so without putting any pressure on your abdomen. This asana also flexes and massages the internal organs, thereby stimulating them. It also releases trapped stress in the muscles and improves blood circulation. It helps battle dizziness, fatigue, and nausea that the first trimester of pregnancy brings with it. How To Do It – Come onto your fours. Bring your feet together, and widen your knees. Rest the abdomen on your thighs and place your buttocks on your feet. Allow your forehead to touch the ground. Stretch out your arms, or place them next to you, alongside your legs, with the palms facing upwards. Pregnancy Modifications – Make sure you do not feel any strain on your back or abdomen when you practice this asana. Stop as soon as you do. Benefits – The Malasana is another pose that works mainly on the legs, especially the hips and thighs. It strengthens them so that they can support your heavy abdomen. It also enhances the circulation of blood and ensures a good stretch in your hips and thighs. It widens your hips and opens up the pelvic area. How To Do It – Squat on the floor, making sure your feet are together, and your buttocks are off the floor. If you are comfortable, lift your body on the balls of the feet. Join your palms at the center, and rest your elbows gently on the sides of the knees. Push your knees with your elbows as wide as possible. Hold the pose till you are comfortable and then release. Pregnancy Modifications – Make sure you do not feel any strain on your back or abdomen when you practice this asana. You can use pillows or blocks to support your hips while practicing this asana in the later part of your pregnancy. Benefits – This is another amazing asana for women to practice. It improves the health of their reproductive system. Practicing this asana helps open up the pelvis. Hence, it ensures an easy labor if practiced regularly (do not overdo). This asana also improves blood circulation and calms the mind. How To Do It – Sit on the mat with your legs stretched out. Then, fold your knees, and join your feet at the center. Straighten your back as you make yourself comfortable. Hold your feet with your palms. Make sure you are comfortable in the pose as you hold it for a few seconds. Release. Pregnancy Modifications – You should not feel discomfort on your back or abdomen. However, if you do, stop immediately. If the joints in your hip seemed to have loosened owing to the pregnancy, ground your buttocks on a pillow. Also, roll some towels and place them under your knees to avoid extending your hips too much. Benefits – This asana completely relaxes the mind and the body. It gives you a boost of energy, almost instantly. Hence, it works wonders in battling bouts of fatigue that happen during pregnancy. This asana helps fight the side effects of pregnancy, and relieves pain, nausea, and morning sickness. Every time you feel sad or tired, do this asana and feel good instantly. How To Do It – Lie flat on your back, with your palms resting beside you, facing upwards. Close your eyes and relax as you place your arms alongside your body. Breathe. Pregnancy Modifications – When you are pregnant, you are advised against lying flat on your back. So, practice this asana by turning to your left. Use a pillow under your grown belly to support it. You can also place a pillow under your head for comfort. As with any form of exercise, remember to take these few quick precautions if you are pregnant. 1. Avoid backbends, inversions, shoulder stands, and headstands. 2. Avoid deep twists and asanas that entail lying on your belly. 3. Remember that comfort comes first. Do not push yourself. Do only as much as your body allows you to. 5. Be mindful of your practice. Remember that you are taking care of two people – your baby and yourself. 6. Consult your doctor and your instructor whenever you feel uncomfortable or have doubts about any sensation you feel. 7. Use props when necessary. Pregnancy is one of the most beautiful experiences of life. It is a bundle of mixed emotions, and a test of your mettle. You experience pure joy and true love for something that is made of a part of you and the man you truly love. Do not let the hormones, emotions, and pains bog you down. 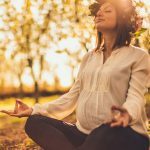 Embrace yoga – you will not only sail through your pregnancy with ease but the much-dreaded labor too. Have you ever practiced any of these prenatal yoga poses during your pregnancy? Tell us how did they help you by commenting below.